Thanks so much for tuning in for the last Season 3 Live Streaming Sunday Sessions. I've so many more aspiring percussionists and new/veteran teachers that are looking for additional resources for themselves and their students. It's been a pleasure! This week, we focus on 4 skill sets where tension commonly creeps into beginning player's hands as they try to push tempos and build chops. Something I write about in my Marching Percussion Playbook is a common misconception that this genre of percussion is more tense or harsh than other genres of drumming. In reality, what separates the top world class players from the developing player is the ability to stay relaxed even during the most physically demanding passages. In today's lesson, we talk about common tension points that players encounter, and how to remedy them. When I get direct messages on Instagram or Facebook from students asking me what they should be practicing, the answer is these kinds of exercises. However, more importantly is the "how": with attention to staying relaxed. 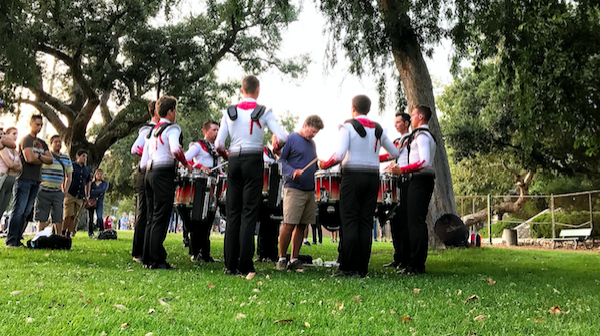 Today's lesson is coming off from seeing a DCI show last night in Pasadena, CA, so I'm feeling especially inspired! When you find yourself struggling, say to yourself, "Just relax." Be sure to tag me on your favorite social media platform @hueiyuanpan, and see you in Season 3!